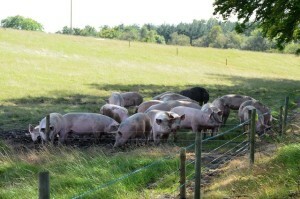 It’s every farmer’s priority to nurture his or her litter of 8lb piglets to a herd of fully grown, 300lb healthy hogs. After all, healthy hogs can be the difference between hefty profits and bonuses or a financial drought for most farmers. That’s why it’s crucial for the hog industry to invest in safe and easy to use scales that will accurately weigh hogs and monitor weight gain as weight is the best indicator of a hog’s health. Let’s also keep in mind that not all hogs grow at the same pace. Some grow too fast, some too slow. The weight of the hogs will determine what feed pen they are sorted into as mixtures of feed do vary from pen to pen to increase, decrease or maintain a weight that is healthy and profitable. If hogs fall sick, medicine dosage is also determined by the hog’s weight. So how exactly do farmers accurately weigh heavy, mobile, and worse yet, frightened hogs? How do they get their hogs to willingly step up onto a weighing platform, one at a time, and remain calm for long enough to take an accurate reading? Unlike corn or grains which are light, stationary and void of emotion, a 300lb, panicky hog displaying sudden and powerful movement is nothing to be taken lightly. Not only can a mishandled weighing hurt the animal but it may also cause damage to the scale itself, both of which will hurt your pockets. On top of that, how did farmers manage to sort hogs into the right pen with the right feed based on their target weight? Let’s remember that although piglets weigh in at 8lb, they do grow to be strong 300lb hogs. A healthy, steady rate of growth must be maintained to ensure the hogs are market ready in time, all at the same target weight. So, let’s just say weighing hogs was certainly was no easy task until Arlyn Scale’s Automatic Pig Sorter was developed by our skilled team of engineers and designers. The Automatic Pig Sorter is able to withstand a weight capacity of up to 800lbs, and is designed to meet safety standards as its low profile requires less of an effort on behalf of the hog to step up onto the weighing platform. This innovative scale solution guarantees farmers precise readings, and even directs hogs to the holding area with the proper feed mixture based on preset target weights. All weight data is recorded for farmers to easily monitor and analyze during the hog’s lifespan. A hog’s home, typically known as a barn, is often built in a way that distinguishes each single feeding area or pen by a special mixture of feed, and separates one pen from another by fences and walkways. Within this structure are several holding areas that hogs are allocated to depending on their dietary needs. Although hogs will spend the vast majority of their time in their designated pens, they do need to emerge from them sooner or later to satisfy their hunger. That’s when the Automatic Pig Sorter comes into play. We install the pig sorter in the route or alleyway the hogs take to their feeding areas. They really have no choice but to walk over the sorter and in-built scale to get to the feed. Training the hogs to adapt to the weighing process is also easy with the sorter’s low profile scale and swing gates at each end of the weighing platform. The number of swing gates installed depends on the number of pens and can be customized to suit any barn. Like a kid learning to ride a bike, piglets also need training wheels. That’s why we made sure our pig sorter smoothly facilitated the weighing process with three easy stages of training. Stage 1: Unfamiliar with the scale’s platform, there’s no doubt the piglets will feel uneasy at first. To reassure the piglet, entry and exit gates are kept open in order to not make the piglet feel trapped as it freely makes its way through the sorter. Stage 2: Confidence building, the piglet is ready for the entry gate to be closed after it enters the sorter. The exit gate is still kept open so that the piglet can see the light at the end of the tunnel which gives the piglet the comfort it needs to remain calm. Stage 3: Familiar with the pig sorter, both entry and exit gates are closed and the sorter is in full operational mode. Once the scale registers an accurate weight, the exit gate will open and the piglet will advance to its feeding pen. Farmers can program the sorter to only allow the piglet to exit into the pen with the proper feed mixture based on a set target weight. Still have a pig or piglet that just won’t behave? No problem! Our automated pig sorter takes many readings in a matter of seconds. The advanced algorithm rejects readings that were taken while the animal was moving too forcibly. Even if the piglet has been panicked or angry throughout the entire weighing process, the sorter will simply record the average reading over a preset period of time and open the exit gate when that time has expired. We understand that it can be difficult for a farmer to differentiate a hog from the rest of the herd. RFID ear tags make record keeping easy for farmers. If this is a system already in use in your barns, don’t worry! You can still use the automated pig sorter and purchase it with an RFID tag reader. Since each hog has its own tag for easy identification, we use radio frequency to read the tag number, which will be transmitted to the digital indicator and recorded along with the pigÕs weight, which can then be accessed from any computer or device, depending on the connectivity option you choose. We offer Ethernet, USB, datalogging, and more! Based in Long Island, NY, Arlyn Scales is a scale manufacturer that leads in the design and development of technology for the weighing industry. Smart Sort Innovation, a division of Arlyn Scales, designs and manufactures all of the sorter’s assemblies including load cells, cages, and electronics to ensure all components integrate flawlessly. The Automated Pig Sorter is the only feasible way to prep your hogs for the market, and will help you qualify more pigs for packer’s accurate weight bonuses. If you want to learn more about what our pig sorter can do for you and your farm, get in touch with us today at (800) 645-4301 or fill out the online form on our Contact Us page.